This is the story of my last craft beer. You see, I dislocated and broke all three bones in my elbow on May 30th. I had surgery to repair the damage on June 6th. I had planned on posting this before the surgery, but wasn’t able to give it the time it deserved. The weekend before surgery I was offered one last hurrah because post-surgery I’d be on heavy pain killers which do not play well with alcohol. As a beer blogger, this was a horrible diagnosis. Since I’m also an avid mountain biker, and don’t want to jeopardize a speedy recovery, I am going to comply with the doctors orders and stay alcohol free until the doc gives me the thumbs up. Enough of the back story, let’s get to it. I immediately thought of a place that I first heard about when I started beer blogging about a year ago. I was at a friend’s house for a backyard BBQ. One of the guests, Rolf, had on a “Pliny the Elder” t-shirt. We started chatting about craft beer, and he told me about this great little spot near his house in Seal Beach where he loved to go. Tons of taps, all craft beer, with a rotating beer list. Oh, and great food too. I chose a beautiful Saturday afternoon for my quick trip up Pacific Coast Highway to Seal Beach. We quickly found a spot to park and walked down Main Street towards the pier. There was our destination, on the right, with a handful of folks anxiously waiting outside. We put our name on the list and were seated right away. After looking over the extensive tap list and seeing so many great beers, I decided to ask the server for a recommendation. I told her about my preference for hoppy IPAs, informed her it’d be my last beer for a while, and she pointed me to the Stone IPA with Simcoe on Cask. I hadn’t had a cask ale since I backpacked across Great Britain back in 2000, so I decided to go with that. I was cautioned that cask ales aren’t very cold and are lower on carbonation than your average draft beer. I was okay with that. Since it was going to be my last beer for a while, I went for the cask ale. It showed up with a cream-like head sitting atop a rich amber-colored beer. The Simcoe hops were very fragrant and dominated the smell. I took a while before the first sip to really soak it all in. This was to be the last beer before my elbow surgery, so I was savoring the moment. The first sip left a bit of a white mustache on my face from the creamy head. (No photos of that, sorry.) The hop profile was amazing, floral, citrus, pine, everything you’d expect from a Stone IPA, and even more. It was served at room temperature, which allowed the flavors to really pop. My first thought was that rooms in the UK are a little cooler than here in the US, because although it’s been a while since I was pub crawling across the pond, I didn’t recall any beers being served this warm. I’m not complaining though, this beer was spectacular. Just the right way to go out on my sabbatical from craft beer. 5 beer soaked caps from me. Ever since I read Beachwood BBQ’s “Way of the Pulled Pork” write-up on their site, I’ve been looking forward to having it. So although I asked for suggestions for beer, my food order was pre-set. We slowly smoke our pork for 13 hours. Enjoyably succulent and tender, pulled pork is best served in chunky bits – a good mixture of the crustier outer pieces and the juicer center – pulled off by hand. Our pulled pork, like our other meats, is rubbed with a unique combination of spices that it has been marinating in for 24 hours. Served North Carolina style, we recommend pairing the pulled pork with our Vinegar BBQ sauce. The acid and tangy flavor of the vinegar is a nice contrast to the meat. As a meal, the pulled pork is tasty, as a sandwich we like it best on our homemade pretzel bun and topped with a hearty portion of our tangy coleslaw – crunchy and pungent flavors mixed together. I chose the Blue Cheese Grits as my side because our server said that’s the one most folks rave about. With a suggestion like that, how could I pass it up. My expectations were set fairly high for this meal. It was my “last hurrah” before undergoing surgery. It needed to be something I’d never forget, or at the very least something that I wouldn’t regret choosing as my final meal. I must say that it lived up to every expectation.The pulled pork sandwich was extremely tasty, the vinegar from the slaw was the perfect compliment, and the pretzel bread was simply scrumptious. I can see why the blue Cheese Grits are a local favorite. Fantastic flavor with a perfect consistency, just like grandmama used to make back in Tennessee, but she didn’t use blue cheese. The beer selection is incredible, the food is fantastic, and the servers are friendly and knowledgeable about the beer. If this isn’t one of your craft beer destinations, it should be. 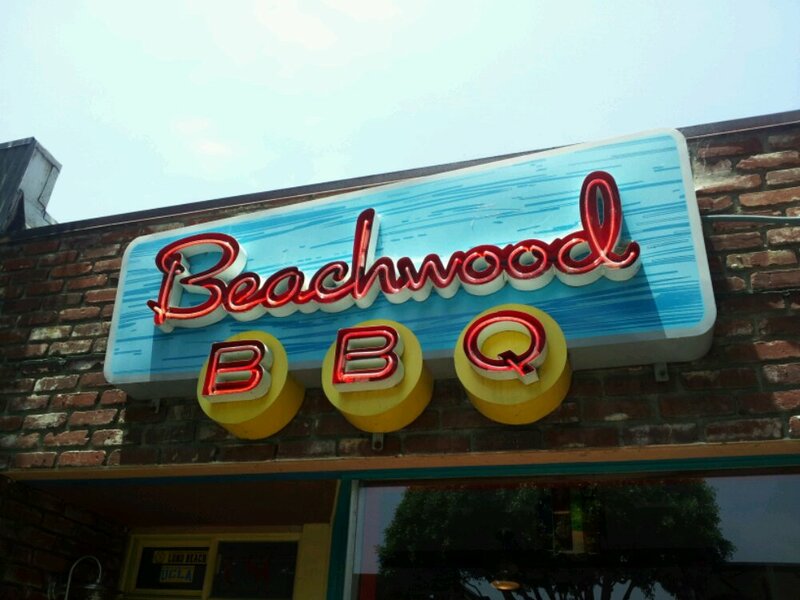 This entry was posted in Ale, Cask, Craft Brew, Food, IPA, Review and tagged Beachwood BBQ, Cask, India Pale Ale, IPA, Seal Beach, Simcoe, Stone Brewing by Erik. Bookmark the permalink. We need strap a GoPro camera on you next time you try to jump the “Grand Canyon” Evil Eric Knevil! !